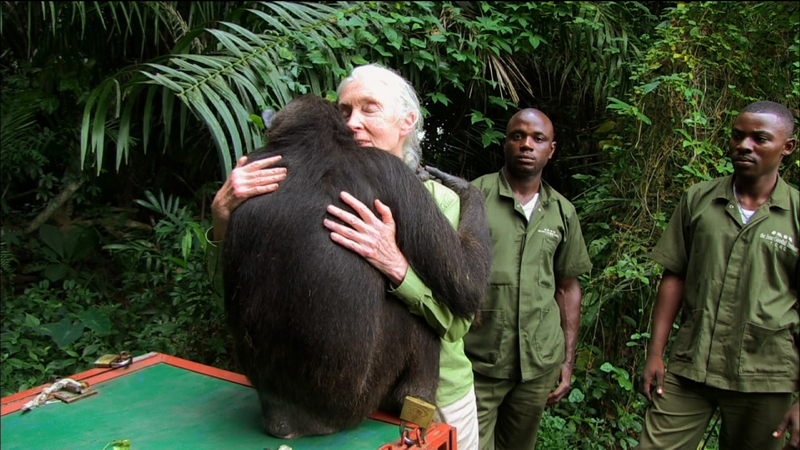 Dr Jane Goodall receives a spontaneous goodbye embrace from Wounda, once a traumatized orphaned chimp, now grown-up, healthy and about to be released back into the wild. From NATURE: ANIMAL REUNIONS. Photo courtesy of Tigress Productions. If you’ve ever doubted that wild animals are capable of forming long-lasting, trusting and loving bonds with their human friends and caregivers, I urge you not to miss Animal Reunions, the latest episode of the PBS series, NATURE, debuting tonight, Wednesday, March 30, 2016, 8:00 – 9:00 p.m. ET. (Check local listings for air times in your region and http://www.pbs.org/nature for online streaming and DVD availability.) I guarantee you’ll set aside your doubts and be moved to tears during the extraordinary reunions documented in this film. My long-standing belief in the capacity of wild and domesticated animals to feel and show love and loss, not only for their own kind but for their human counterparts, was validated 21 years ago. At that time, I was a fan of ABC-TV News 20/20, when it featured empowering think pieces, as well as fascinating reports on “the better angels” of our nation. In a concluding segment one Friday night in 1995, host Hugh Downs explored the problematic exploitation of chimpanzees in the space program and biomedical research; by that time, both of those dubious enterprises were under scrutiny, even by those who were employed to implement them. As a result, retirement sanctuaries for these physically and emotionally damaged chimps were starting to spring up. Downs zeroed in on animal rights crusader Dr. Roger Fouts, then at the helm of Central Washington University’s Chimpanzee and Human Communication Institute (CHCI). Fouts had pioneered communication with chimpanzees through sign language; his first pupil was a baby chimp named Washoe. Another language studies student, Booee, was taught to sign by Dr. Fouts beginning in the late 1960s. But Booee was inexplicably sold to a medical research lab by his owner in 1982. In the name of “science,” he was infected with, among other things, the Hepatitis-C virus. I was not the only viewer that night who was overwhelmed by this gut-wrenching reunion and its moral implications. I immediately wrote to ABC News to find out how I could help Booee. I was not alone. The episode drew unprecedented response and was followed up with an update on Booee’s status. The moral outcry incited by this ABC News report led to Booee’s retirement from medical research; but because he had been infected with Hepatitis-C, Booee could not be returned to Fouts. The chimp was released into a sanctuary in California where he could live out his life in a healthy environment. 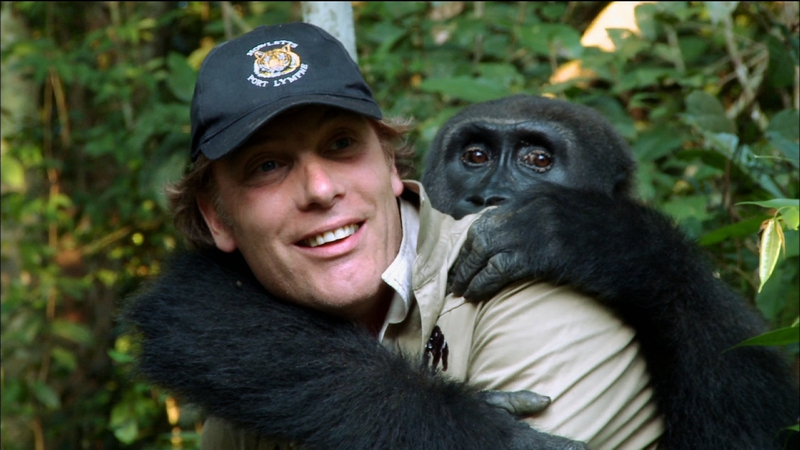 Conservationist Damian Aspinall reunited with chum Kwibi after the gorilla, who was raised in Aspinall’s animal sanctuary in the UK, had been released for five years in a West African national park. Kwibi’s journey is documented in NATURE: ANIMAL REUNIONS. Photo courtesy Tigress Productions. It’s apparent, as witnessed in the remarkable human-animal reunions documented on PBS in Nature: Animal Reunions, that animal researchers and conservationists have made great strides in the two decades since that ABC News 20/20 episode aired. They have ably added to our understanding of interspecies communication, respect for animal emotions and feelings, and acknowledged the positive bond that can grow between wild animals and responsible human caregivers. Animal Reunions recalls, in riveting fashion, recent examples of how Great Apes, like chimpanzees and gorillas, as well as elephants and even cheetahs have formed lasting bonds with caring human beings. The caregiver and animal rights champions profiled include Dr. Jane Goodall, wild animal conservationist Damian Aspinall, chimp veterinarian Dr. Rebeca Atencia, wild animal photographer Kim Wolhuter, and elephant rehabilitator Edwin Lusichi. 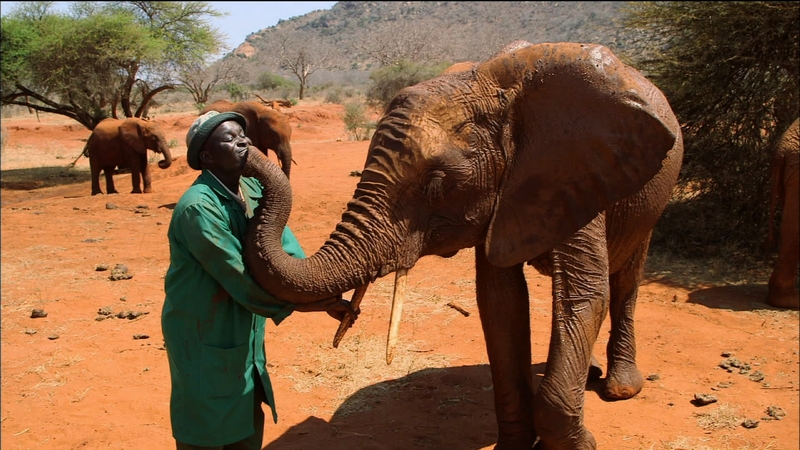 Head Keeper Edwin Lusichi with once-traumatized orphan elephant, Lempaute, as the pals reunite after the elephant’s reintroduction into the wild at Tsavo East National Park, Kenya. Lusichi recalls his tender relationships with elephants under his care in NATURE: ANIMAL REUNIONS. Photo courtesy Tigress Productions. The hour-long film focuses especially on the years following the restorative rehabilitation of orphaned, traumatized and/or captive-born animals and their reinstatement back into the wild…and how they never forget and continue to cherish their human saviors. It’s a must-see for anyone who respects the well-being of animals, wild or domesticated, and the depth of their emotional core. The latest installment in the award-winning PBS series, NATURE, executive produced by Fred Kaufman, Animal Reunions is a Tigress Production for ITV in co-production with THIRTEEN Productions LLC for WNET. This entry was posted in TV and tagged ABC News 20/20, Animals, Booee, Chimpanzees, Conservation, Damian Aspinall, Dr. Rebeca Atencia, Dr. Roger Fouts, Edwin Lusichi, Elephants, Gorillas, Great Ape Project, Howletts Wildlife Park, Interspecies Communication, Jane Goodall, Kim Wolhuter, NATURE. Bookmark the permalink.